in rnds, in chart patt using larger needles, after washing. 6½" (16.5 cm) foot circumference and 6" (15 cm) long. 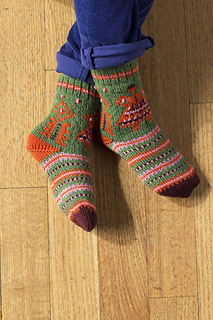 These beautifully colorful and patterned little Elfur Socks were inspired by the traditional fantastically colored and patterned knitted stockings made on the Estonian island of Muhu. 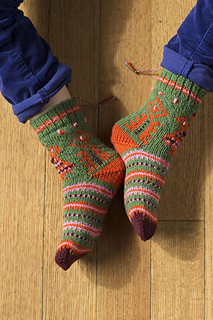 The Elfur Socks are knitted from the top down and have a colored rib pattern, a small plaited tassel, traditional geometric patterns on the leg, and bands of colorful patterns on the foot. French knots and duplicate stitches are used to further embellish the designs. The Elfur Socks have a traditional Estonian heel, which is worked after the rest of the sock has been completed, as well as a distinctive Estonian toe shaping. The shaping of both the heel and toe is done with a specific Estonian decrease technique. Not only will the Elfur Socks be wonderful to wear, but they would also look very sweet hung up and filled with little festive treats. You could make a larger pair of Elfur Socks by using a heavier weight of yarn—you just need to follow the suggested gauge of whichever yarn you substitute. Set of 5 size U.S. 1 (2.25 mm) double-pointed (dpn). Set of 5 size U.S. 2 (2.75 mm) double-pointed (dpn). Marker (m); waste yarn; tapestry needle.